For many growing businesses, good customer service is necessary for continued success. More small businesses and entrepreneurs are beginning to understand just how important customer service is in the age of the internet, where bad word-of-mouth can travel across the globe and tarnish a reputation after one small mistake. Understanding the importance of their customer service, many business owners will try to do it themselves or hire an in-house team. Unfortunately, this is one of the easiest ways to both overpay and provide poor service. Outsourcing is an increasingly common option with a lot of benefits. Here are twelve reasons why outsourcing your customer service to a call center is a good idea for your business. While a lot of people think that using a call center is more expensive, the exact opposite is true. Since call centers have an infrastructure and a team of employees, they can charge much less than it would cost for a business to create their own customer service team. Customer service can be expensive, especially when you consider employees’ salary, benefits, and training. Outsourcing will save your business a lot of money. Some entrepreneurs decide to do their customer service themselves or split it amongst their core team. As your business grows, customer service can quickly take up the majority of your time. Outsourcing your customer service allows you to reallocate your time and expertise to where it is needed most, allowing you to focus on the core responsibilities of your business. Customer service, like any field, requires skill. There are a lot of best practices and techniques that only a professional customer service rep will know. Trying to do things yourself or use unqualified individuals can result in PR disasters that damage your business. 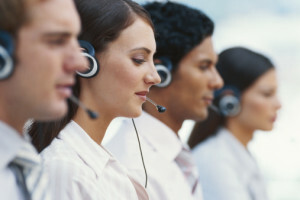 With a call center, you have access to a team of trained, qualified professionals. One of the great things about call centers is that they can offer additional services, flexible schedules, and other capabilities well beyond what in-house customer service could likely handle. If you need 24/7 service or more customer service reps for high-volume periods, a call center can handle that. Call centers can tailor their service to meet your needs. Outsourcing allows you much greater flexibility. Inbound call center services, such as answering calls or e-mails, are what people commonly think of when they hear the words “customer service.” However, many call centers can offer outbound services that can help increase your business. These services can include “welcome” calls, “winback” campaigns, and cross-selling. Through outsourcing, you can make your customer service another avenue to grow your business. The phrase “time is money” still rings true because it’s actually a factual statement. The way you manage your time as a business is directly related to your bottom line. Outsourcing your customer service means you can focus on other aspects of your business that needs your time and attention. Spending your time on tasks like training employees is unnecessary when outsourcing is the more viable option. Today, customers are more demanding than ever when it comes to the type of service they expect. Customers want to feel as if the entire company is catering to their needs, and if they don’t feel this kind of attention, then there are enough competitors for them to take their business elsewhere. An outsourced customer service agency already has the expertise and the experience of handling customers every day. Keeping your customers happy means keeping your pockets lined with revenue. Outsourcing your customer service is an opportunity to remove some of the workload from your operations. Managing customer service can be difficult whether you are a new business or a business in a heavy growth stage. Having a reliable customer service team who understands how to deal with customers becomes invaluable. The less you have to think about as a business owner, the better. One great aspect of outsourcing your customer service is that we typically work longer schedules. This means that customers are able to reach your business even when your business has closed for the day. Customers are more satisfied as you continue to serve their needs without having to play some automated message instructing them to call back during business hours. Call center agents are here to manage your customers. That will be our job. We will work to understand your operations so the transition is seamless, and a capable team of call center agents is skilled enough and experienced enough to ensure this all goes well. No worrying about missed calls or customers who are unable to speak to a live agent. Call center agents have you covered. Just like technology has changed the way many industries do business, it has impacted the call center industry as well. If you are not up to date with the latest technology, then that’s a strike against your for your customers. Outsourcing your customer service to a call center means you will have a team that is already working with the most significant technology. That means customers can be assured they will be receiving the best service possible at all times. Many call centers are able to provide service in multiple languages. This is obviously a significant advantage and allows you to better communicate with a portion of your customer base. If you do end up outsourcing your customer service, you should find out what other languages they offer.